Your Diamond Jewelry is essential possessions that need some care if they are to last long. While diamonds are hard and seldom affected by continuous showcasing, they require specific attention because they can still be damaged by chemicals, or scratched by other objects. Caring for your diamond jewelry such as unique diamond rings goes a long way towards ensuring that you can enjoy wearing them for a long time. What’s more, you will need to clean them and store them in a dry, safe place whenever you are not wearing the jewelry. 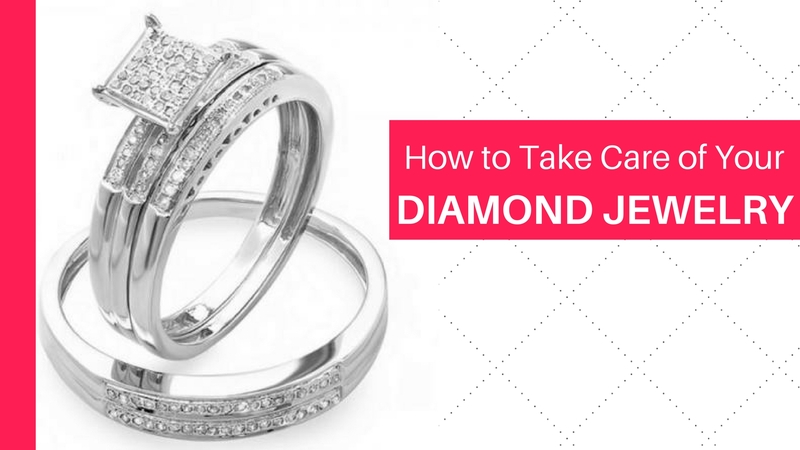 Here is a quick guide explaining the things you should do and things you should avoid to take care of your diamond jewelry. Yes, your ornaments may get in your way occasionally, but feel free to flaunt your diamonds to your colleagues, employees or boss unless your place of work is not diamond jewelry safe. You need to clean your diamonds regularly to get rid of everyday dirt, dust, lotions and skin oils to ensure that they sparkle. These things can cloud your diamond. However, when you clean the stone, you will be surprised because your jewelry will shine brightly. The simplest way to clean your jewelry is to add mild dish soap in warm water and soak them in it for about fifteen minutes. Scrub them gently using a soft bristle toothbrush to get rid of any dirt. You can also use any brand of jewelry cleaner. If you do not want to clean the jewelry yourself, you could visit your jeweler and have them do a professional cleaning for you. You can do this once every six months. Your diamond jewelry is an investment, and just like other investments, you want to protect them in case they get lost, destroyed or stolen. Ensure that you get the right coverage for your jewels by seeking the services of an insurance company that specializes exclusively in jewelry. This way, you will always have the peace of mind knowing that you are getting extra protection that exceeds what a typical renter’s or homeowner’s insurance provides. Most diamond jewelry such as diamond rings, or black diamond rings is made of either platinum or gold. The former metal is not only sturdy but beautiful even though it lacks the luster of gold. On the other hand, gold jewelry also needs to be re-polished unless it is rose or yellow gold. The coating of your jewelry will fade, especially when you wear it while doing tasks such as washing dishes or showering. To restore that pure, beautiful shine, you will have to get your jewelry re-coated and polished. When correctly set, your diamond should be very secure. However, stones in diamond rings can get banged up a bit through daily wear, and you would be surprised to know how easily that tight prong you thought was secure can loosen. Therefore, ensure that mounting of your diamond is always intact and not loose. Loose stones can fall out, and nothing can be more devastating while looking at your jewelry only to notice that your setting is empty. Diamond or other pieces of gemstone jewelry such as gemstone diamond earrings are always presented during happy occasions, meaning that they have sentimental value. What’s more, they do not come cheap. Someone, including you, spent money, so it is your responsibility to ensure that you maintain the quality of your jewelry. To maximize the appearance of your jewelry while minimizing your visits to your jeweler; do not wear your jewelry while performing these tasks. Water can damage the luster of the metal as well as the stone because it contains different chemicals like chlorine that can be damaging. Some of these chemicals used for cleaning may work wonders on the stone, but they will eventually damage the metal. Always keep your jewelry in your jewelry box or a velvet box; or invest in jewelry that can stand being kept in any convenient place while performing daily chores. Removing your jewels and setting it down in public can be very tempting, particularly when you have to wash your hands in public. This is not wise because the chances of you leaving the jewel behind once you are done are very high. Be careful and mindful and do away with this temptation. If you must remove your jewelry, place it in your pocket or purse. This way, if you forget to wear it, you will still be at peace since you know the jewel is always in your possession. Although activities such as aerobics will not hurt your jewelry, other forms of workouts definitely will. For instance, weight lifting can damage your jewelry, particularly rings. The steel of these weights is hard and can dent the metal of your jewelry. Heavyweight lifting also distorts the shape of jewelry, making them oval rather than round. When the metal is destroyed, it can cause the prongs on the precious stones to become loose, and your diamond may fall out. Other sports that can cause damages to your jewelry include tennis and golf. Each piece of jewelry is different and would need that you take care of them differently. Ornaments that come in platinum settings have different care needs than those that have gold settings. Moreover, diamonds that have been set in prongs also require more careful attention as compared to those in a bezel setting. Consult a jeweler while purchasing your ornaments, to get to know what you need to do, can help you prolong the life of your jewelry. Ensure that you stick to the guidelines they offer to get the utmost results. After all, you do not purchase or get diamond jewelry every day. The post How to Take Care of Your Diamond Jewelry appeared first on Dazzling Rock Jewelry Blog.